Last spring when I was at a workshop, my iron died. It’s a frustration to me but not a surprise when an iron dies. I ask quite a bit from my irons as they are working for me for me at least a few hours each day. I am sure your regular household consumer irons only once a week. 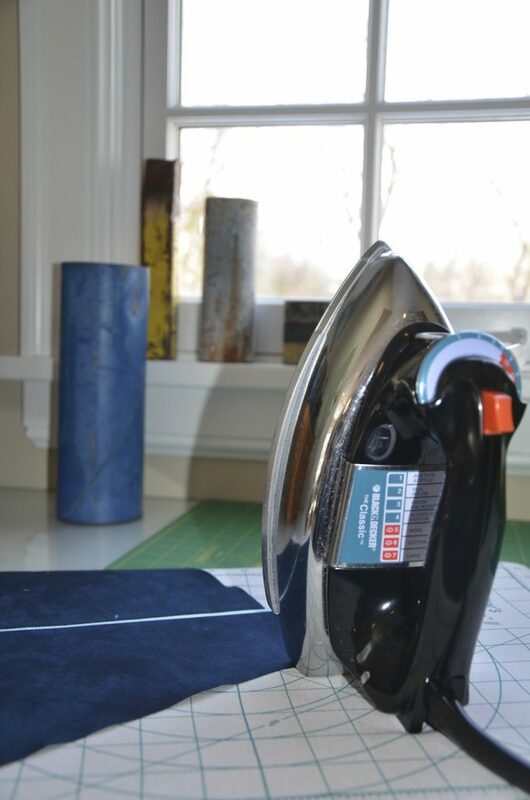 Iron replacement seems to be a yearly or six month occurrence lately and I feel as if I am always replacing an iron. So I spend time researching which iron has the most reliable reviews and I choose the best iron for the best price. But , at a workshop, my only choice was to go to your local big box store across the street from the hotel and choose an iron as soon as possible. I chose this little guy for all practical reasons: he is cute and vintage looking. I threw all my research out the window for cute and vintage looking. I love this little 25$ iron . It is a bit heavy but the heat is wonderful. I also love the sharp tip which makes for nice smooth ironing and pressing out those pesky stubborn seams. I never use water in the iron (only in my spray bottle) so I can’t vouch for how well it produces steam. And about 6 months later, it is still working strong for me. Back to work for me today. I am working on designing a large piece which is always a challenge. 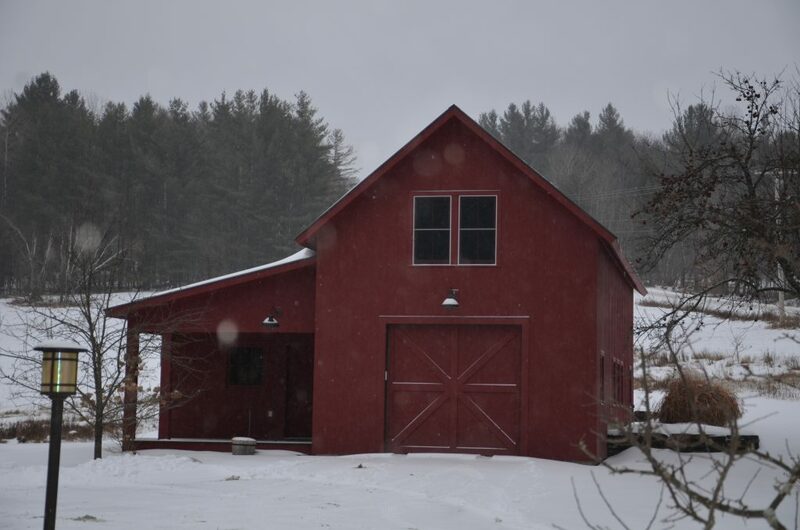 This entry was posted in Tools and tagged iron, tools on March 7, 2014 by Colleen Kole. I love little things that make my job easier. And I always learn something at a workshop that I can apply to what I am doing. 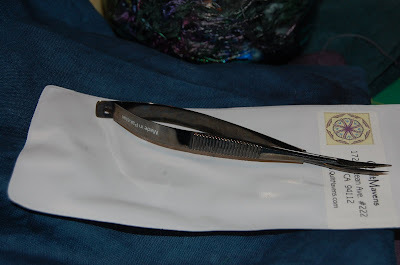 This little scissors is perfect for ripping out tight seams. It’s actually a suture scissors. I bought one from Deb Kurasik at my workshop on Wednesday. The stitch length she recommended for paper piecing was 1.5-tiny -so ripping out was not fun. They really helped . 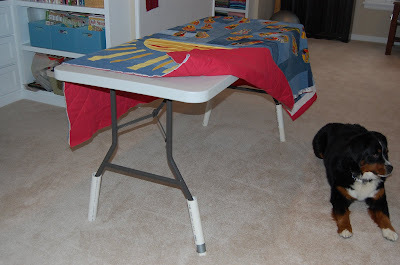 Also, I remembered some table extensions that we had used in a fabric dyeing class last spring that put the table at just the right heighth for working in a standing position. When I asked Betsy, my friend who is in charge of organizing the programs where they came from she smiled and went and got me a set of four from the closet. I must move with my day. I am Mr. mom this weekend-dad and mom rolled into one as Marc is skiing in VT with his friends. 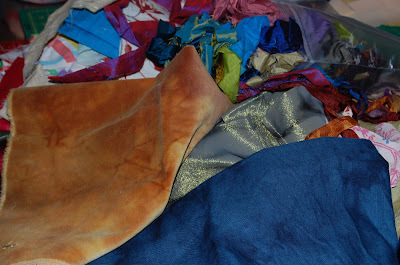 I am tempted to begin something with this beautiful blue linen I dyed this summer, velvet and a drawer full of silk scraps I pick up along my way. I have a show I entered and must have a piece for in three weeks. Fun-remind me I feel no pressure! This entry was posted in hand dyes, recycled jeans, silk, Tools on January 29, 2010 by Colleen Kole. I seem to be having a hard time getting consistent studio time in this past week. Just took my daughter back to college so maybe I’ll be able to settle in this week yet. As I was cleaning up yesterday, I noticed a few things around my studio that I couldn’t part with-not that I couldn’t part with but that I would miss if it was misplaced or lost. They just make me happy to work with. The first is my felted bowl. 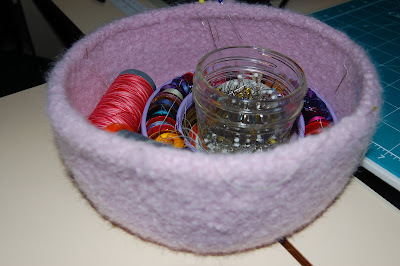 It is so soft and keeps all my thread and bobbins contained. 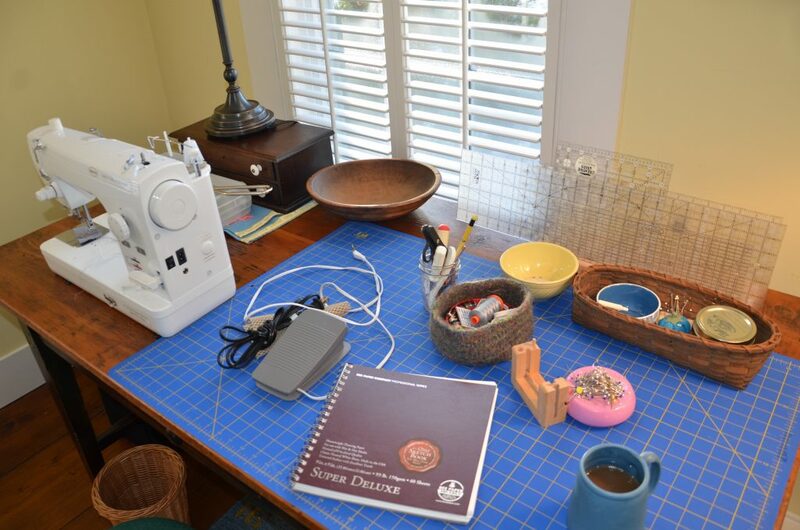 I reach for it in the exact same place on my sewing desk and if it’s not there when I reach for something, I have to re-arrange so it’s right. I know you know what I mean. Don’t you have something like that in your workspace? The second is my antique caddy. 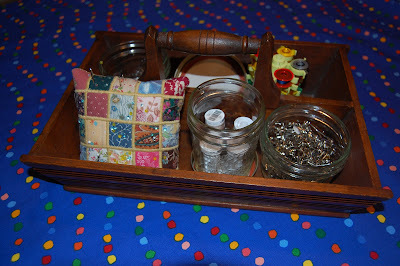 It’s full of canning jars and everything there has it’s space too-straight pins, safety pins, pin cushion and major catch-all space. 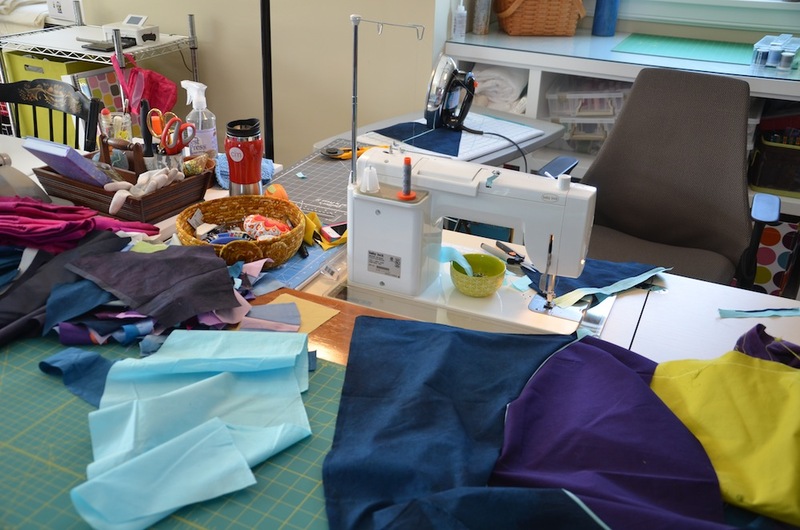 Believe me when I say that I am not neat when I sew. Organized, yes but neat, no. Which is why I was cleaning up last night! 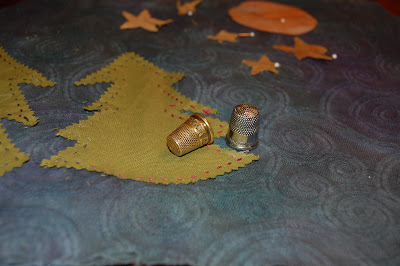 And my last treasures are my thimbles-each beautiful in their own way. They are all low tech items. Old and some even antique, I suppose. But treasured. And with all the mess and all the stuff, this is what I needed in the end to get me started today! This entry was posted in Tools on January 11, 2010 by Colleen Kole.